Giving a portion of every reservation to vegan charities. The more you dine using our app, the more support they get. We will be recruiting vegan enthusiasts around the world to help us out on a commission basis to sign up restaurants and coach them on how to “plantify” some of their menu offerings, and explain why it’s important to have those options for their customers. We will also be supporting the home-cooked food movement by being the only existing home-cook app to focus purely on plant-based dining. Vegan cooks who want to start a business from their home on their own schedule are encouraged to create a “Cook” account in places where it’s legal. 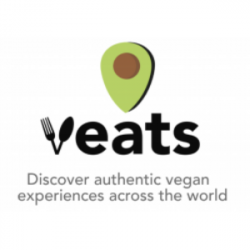 Contact us at eat@veats.app for more details. People just interested in eating vegan food, should create an “Eater” profile to search all of the available options. People who want to do both can create a “Both” profile and create events or make reservations to eat! Although we wish all restaurants were vegan, and we know many vegans won’t eat at restaurants where animal products are sold, we decided that it’s important to offer plant based meals in as many locations as possible to start introducing people to vegan food who wouldn’t normally consider it, which will grow the movement and save lives.